Judo - the Japanese martial art and sport is translated as the gentle way. The philosophy behind the gentle way is in order to overcome an opponent one should not merely exerted force, but rather use an opponents force against them. For example, when an opponent pushes a judo practitioner they will pull their opponent to the ground taking advantage of gravity, not fighting against it. The lesson to be taken away from this philosophy is 'go with the flow' and be willing to adapt. Sometimes life throws a curve ball and plans go awry. I had planned on doing a smoked freshwater eel rillette recipe for years. Freshwater eels are important in both Western and Eastern European cuisine as well as in Asia. Imagine how happy I was to find a whole smoked eel fillet at a local Eastern European specialty grocery store. I had a recipe floating around in my head, and the final step before purchasing this eel was to check The Monterey Bay's sustainable seafood purchasing guide. Unfortunately, the fresh water eel is currently on an avoid status. That meant smoked eel rillette was a no go. As my plans came crashing down I decided to rethink my options and check what else my local grocers were able to provide. The two most common smoked fish options in my area were salmon and trout. Both are extremely tasty but salmon can be tricky in regards to sustainable purchasing options, determining factors on this are where it is caught, how it was caught or how it was raised. 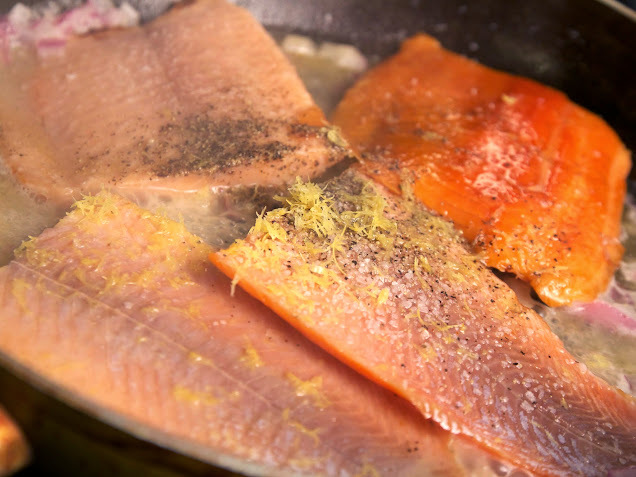 Farmed trout are a great option (Seafood Watch), and delicious as well. Rillettes are not a common food in America, but the French have long known how wonderfully rich this appetizer or snack can be when served on top of a toasted slice of bread or warm crostini. Rillettes are generally a meat spread that is very similar to a pate. Modern takes on the rillette include duck, rabbit, goose, seafood, or even vegetables which with fats or oils and stored in a jar or ramekin. (Ruhlman and Polcyn). Originally, the rillette was the meat and/or liver from a pig which was cooked in its own fat over a long period of time, also known as confit. The fat enriched meat would be stuffed into jars and heavily salted. This would make it difficult for bacterial growth within the rillette. The meat would then be covered with excess rendered fat (French Country Food). 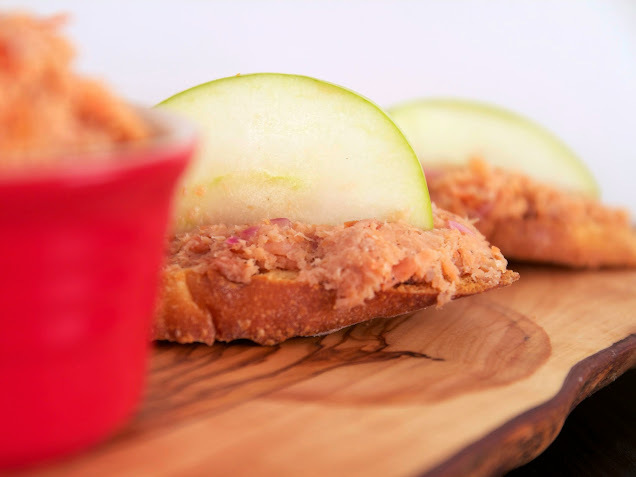 Once the layer of fat hardened the rillette was protected from oxidizing and bacterial growth. This preservation method was common in the French countryside and the rillette was considered peasant food. The rillette was an innovation of practical sustainability to keep pork consumable well after slaughter. The spirit of peasants not being wasteful meets modern conservationist in this recipe. In honor of this cross-section I developed the spread to fit the smoked trouts flavor profile as opposed to that of smoked eel. For this reason I introduced fresh horseradish into the dish. Horseradish only grows in northern climates where there is a strong winter (Wilde). The trout, tart apples, and horseradish which are the three boldest ingredients in this dish are all commonly found in the Midwest, specifically in Indiana. The dish is locally sourced, environmentally conscious, and filled with interesting and delicious flavors. Melt butter. Add shallot until soft, but don't brown. Add trout, wine, lemon zest, salt and pepper. Cook between 5-8 minutes, then let come to room temperature. Transfer to mixing bowl or low power food processor, mix until a smooth paste then transfer to ramekin. Put thinly sliced green apple pieces into a small bowl. Cover with the juice and zest from one lemon and salt. Let rest for at least 30 minutes. "Rillettes." French Country Food. N.p., n.d. Web. 11 Jan. 2015. 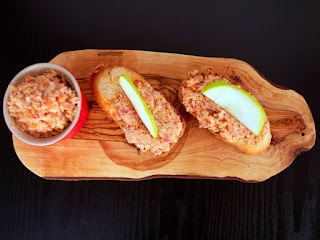 <http://frenchcountryfood.com/recipes/entrees/rillettes.html>. Ruhlman, Michael, and Brian Polcyn. Charcuterie: the craft of salting, smoking, and curing. New York: Norton & Company, 2005. Print. seafoodwatch.org. Monterey Bay Aquarium, n.d. Web. <http://www.seafoodwatch.org/>. Wilde, Barbara. "Horseradish." Organic Gardening. N.p., n.d. Web. 11 Jan. 2015. <http://www.organicgardening.com/learn-and-grow/horseradish>.